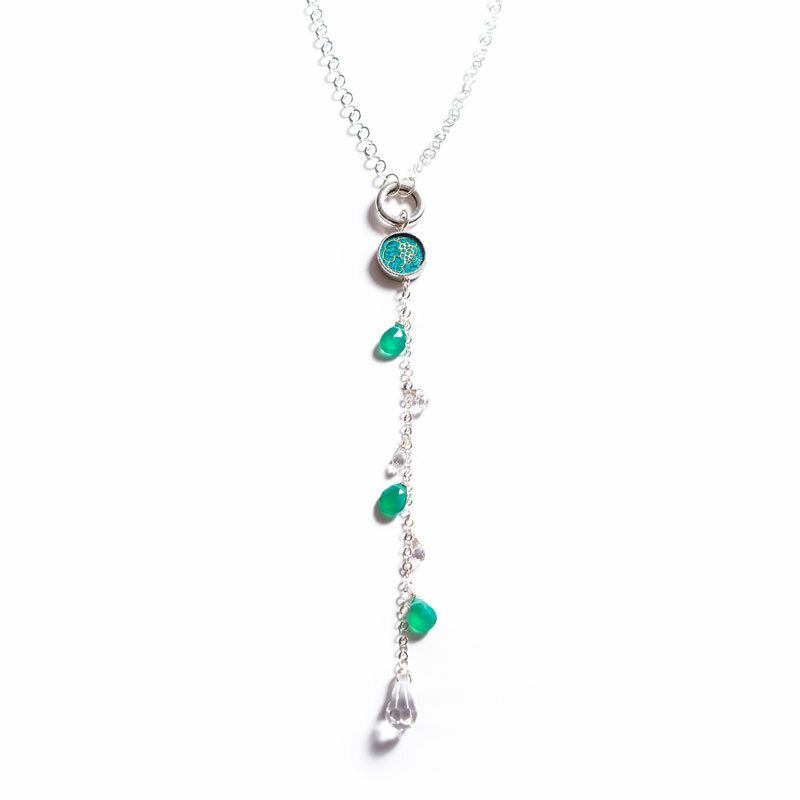 The Toggle Necklace is a stunning silver drop necklace centered with a silver lever toggle clasp. An alluring length of silver chain and gems dangles from the Shi piece suspended from the silver clasp. The clasp and double sided Shi piece sit on the chest at approximately 18-19 inches. The toggle clasp pushes inward, by which you can clasp and unclasp the necklace chain, and interchange the Shi strand with other Toggle necklace strands. Every piece of Shi jewelry is individually crafted and features a unique cut of your chosen silk. All Shi Studio accessories are handmade in Canada. Shi Studio provides custom handmade work created specifically for you. Each piece has varying time frames for us to make and we normally ship our pieces within 2-3 weeks. We can accommodate faster order at times; please ask if you need your piece(s) sooner. Shipping cost is dependent on the product ordered and is calculated on region and weight. The price of shipping will be added to the online generated invoice at the time of checkout. If for any reason you are unhappy with what you receive we will replace or refund your order. Quality and integrity of service and product is our mandate. Shi Studio glass and textile fusion accessories primarily use the traditional dynastic pattern silk brocades of Southern China. Some of the pieces are full sterling silver but most of the pieces are constructed based on the principles of stained glass. For these pieces, the backings on the pendants and earrings are stainless steel and the edges are a lead-free solder made of silver, copper, bismuth and tin. There is no nickel in any of our pieces. The bails and findings, including shepherd hooks, are all sterling silver.The chains are all sterling silver or brass. We use a variety of leathers including full grain Italian cowhide and Italian lambskin. Where appropriate we use high quality vintage and upcycled garment leathers. These accessories are made with glass. Please handle with care. Do not immerse in water. If the solder tarnishes slightly, then buff with a rouge cloth which can be found at most jewelery stores. The solder can also be buffed lightly with super fine steel wool. For the complete sterling silver pieces only use a silver polishing cloth to buff. In order to slow the process of oxidization or tarnishing you may store your shi pieces in air tight or zip lock bags. A little note regarding the belts: The Shi Lucky Belts are best worn with the tip positioned behind the main belt strap. They are also designed to be fitted for the first three holes closest to the belt tip.